Try the classic cheeseburger you love with a twist: The Bold 'n' Saucy Cheeseburger. 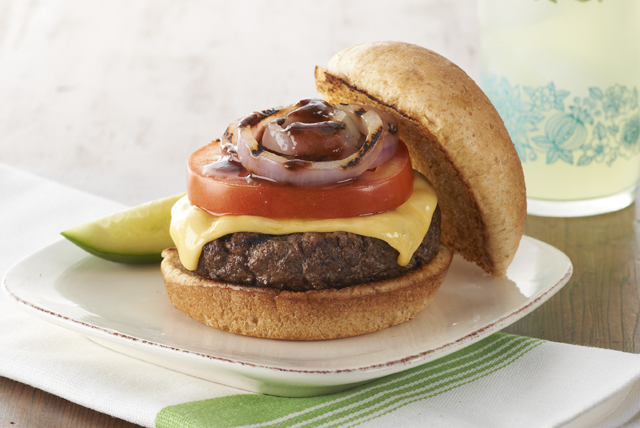 This saucy cheeseburger has a better-for-you twist that you'll love! Mix meat and 2 Tbsp. steak sauce; shape into 4 (1/2-inch-thick) patties. Spray both sides of onion slices with cooking spray. Grill patties 5 to 7 min. on each side or until done (160�F), adding onions to grill after 2 min. and cooking until crisp-tender. Top burgers with 2% Milk Singles; grill 1 min. or until melted. Fill buns with burgers, tomatoes, onions and remaining steak sauce. Toast hamburger buns before filling. Place buns, cut-sides down, on grill grate with burgers; cook 1 min. or until lightly toasted. Create an entire meal that can be cooked on the grill. Start with this tasty burger recipe, then add some grilled cut-up fresh vegetables and fruit for dessert!